In an effort to increase the number of RO soundings available to the research and operations community, the COSMIC Program has initiated acquisition and processing of data from additional U.S. and international missions beyond COSMIC. RO data from the U.S. Air Force C/NOFS-CORISS (Communication/Navigation Outage Forecast System - C/NOFS Occultation Receiver for Ionospheric Sensing and Specification) mission is now being provided in near real-time to NOAA and the global operational weather community via the Global Telecommunications System. C/NOFS has been providing about 150 occultations per day in the equatorial region. Near real-time flow of data from the Argentinian SAC-C mission has been suspended due to a spacecraft power anomaly. 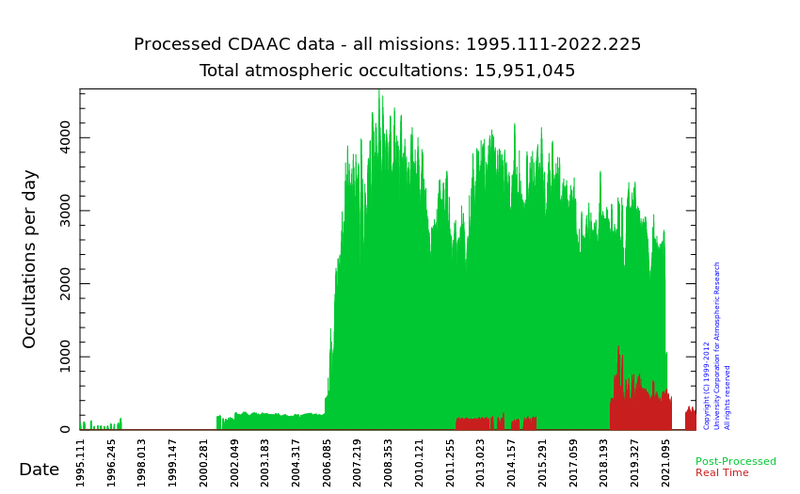 The CDAAC also makes post-processed data available from other available RO missions (GPS/MET, CHAMP, SAC-C, GRACE, MetOp-A/GRAS, MetOp-B/GRAS, TerraSAR-X) and now provides over 5.8 million profiles to researchers as shown in the figure below. 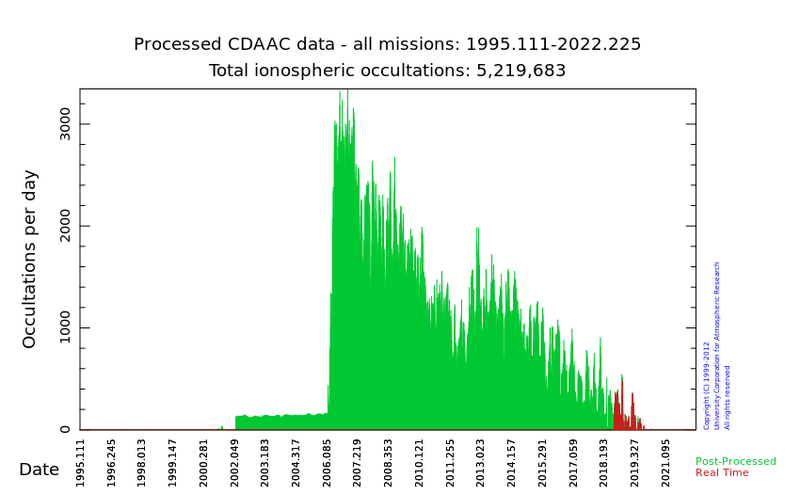 Of note, the CDAAC profiles from MetOp-A/GRAS (GNSS Receiver for Atmospheric Sounding) are derived via wave optics methods with open-loop data in addition to closed-loop tracking data to provide useful profiles in the lower troposphere. In the near future, the UCAR COSMIC Program is planning to process data in near real-time from several upcoming RO missions including Korea's KOMPSAT-5 and Spain's PAZ (2016).